For visitor's information, go to Five-Islands-Lighthouse on Facebook. The Five Islands Lighthouse Preservation Society was formed in 1996. Colchester County purchased the lighthouse and it was moved onto the property of Sand Point Campground. The Society leased the lighthouse from the County and the land from Sand Point Campground for a nominal sum yearly. 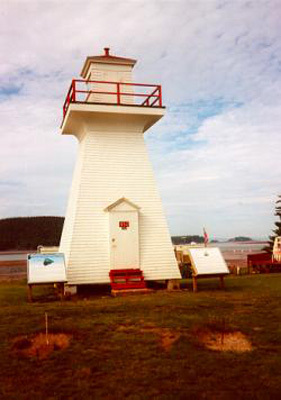 On November 6, 2008, the lighthouse was moved on the back of a flatbed trailer from the campground to a new site on Broderick Lane, about 7 kilometres away. From, the new site you get a wonderful panoramic view of the Five Islands after which the lighthouse is named. 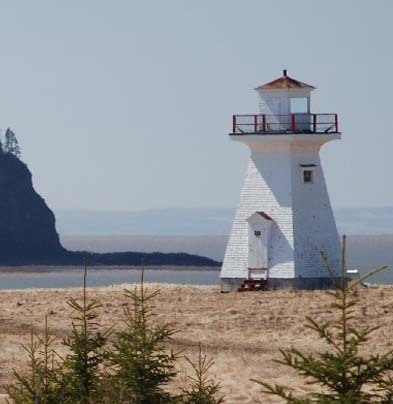 The lighthouse is part of the Fundy Shore Ecotour. On April 28, 2010, at the AGM of NSLPS, the society was awarded the Craig Harding Lighthouse Preservation Award which is presented annually to recognize an organization or individual that has done outstanding work in saving lighthouses. Photo - © Kathy Brown, The Five Islands Lighthouse at the new location on Broderick Road. The Lighthouse is a wooden structure and was built on 2.132 acres of land at Sand Point in the winter of 1913/14. The kerosene light was first lit in 1914. About 1963 the oil lamp was removed and a battery operated system was installed. In 1967, when electricity arrived at Sand Point, the light was changed from white to red. 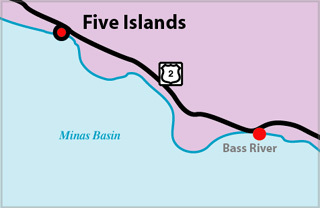 The Minas Basin has the highest tides in the world and there is considerable erosion annually. The light was first moved back in 1952 and again 5 years later. It was placed as far inland as the property allowed and remained there until 1996. Nearly all of the land was gone, the base of the light was washing away and the Coast Guard was trying to dispose of the light which had been deactivated in 1993. On November 6, 2008, the lighthouse was moved on the back of a flatbed trailer from the shore at the campground where it had been since 1996, to a new site on Broderick Lane, about 7 kilometres away. The campground had been sold. Fortunately the Municipality of Colchester realized the importance of the lighthouse to the community and to tourism in the area and facilitated the move. The lighthouse is open to the public in the summer at the new site. Long-term plans include walking trails, benches and signage.